Savor the authentic taste of traditional cuisine. The flavor of food of days gone by. That’s the essence of Exter. The pure flavor of traditional food made from ingredients sourced from nature and the farm. Food cooked like your grandmother used to – with passion and care. This is what Exter has done for 70 years. Exter, started as a family business, has grown into a company that exports to 42 countries around the world. The company, located in The Netherlands, just north of Amsterdam, employs 65 people. As a niche player Exter is committed to delivering the taste you want to create. It’s no wonder that Exter works together with food manufacturers from around the world, always with a personal touch and in close cooperation. Exter creates sophisticated taste bases of cooked meat, fish or vegetables. Imagine the delicious flavor of grilled chicken with sautéed onion and tomato or clear beef bouillon with leek and fennel. Exter’s flavors are based on vegetable protein and it is this basic raw material that allows Exter to produce most of its products kosher certified by OK Kosher Certification. Grilling, stir-fry, steaming, boiling and roasting – in Exter’s kitchens everything is cooked in traditional style. Slow cooking, respecting time and the purity of the produce. The aim is to tempt the consumer to taste and appreciate the difference and above all to keep coming back for more. The five basic tastes have no secrets as far as Exter’s chefs are concerned. Bitter, salt, sour, sweet or umami, the chefs know how to transform these into the flavor you need for your product. A flavor that lingers. Not only in your mouth but also in your memory. That’s how Exter and its customers work together for their success. The worldwide network of distributors is ready to help you to make your food a genuine experience. Always personal, always available. Together they give flavor to life. Exter has worked with the OK for the last 18 years. First supervised by Rabbi Spiro, and now by his son, its liquid aroma factory has been completely kosher for many years. As a matter of fact, the cooperation has been so successful that Exter is now moving from kosher campaigns that took place 4 times per year to full-time kosher production in its powder factory as well. Mr. 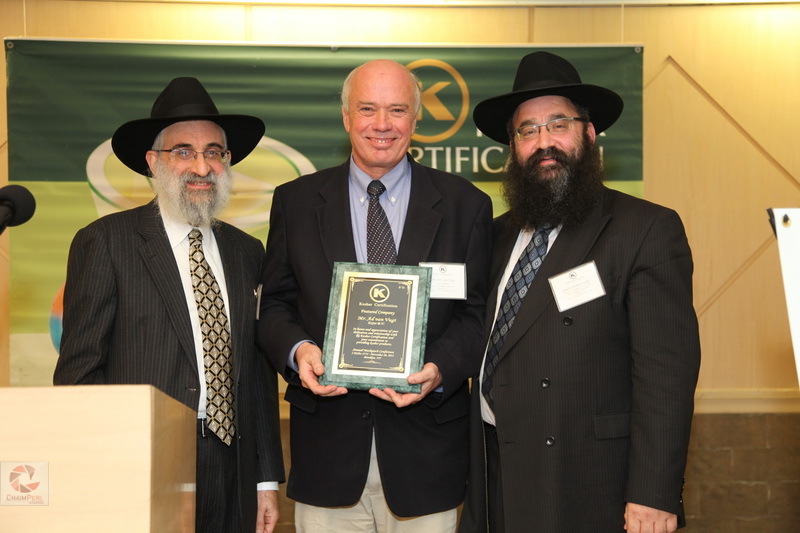 Ad van Vugt of Exter BV was recently honored at the Annual International OK Mashgiach Conference for his commitment to the kosher consumer and his longstanding relationship with OK Kosher Certification. 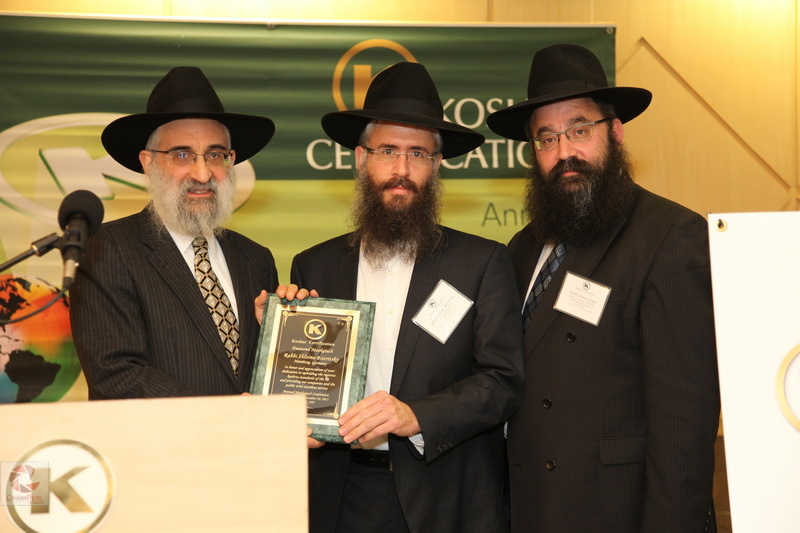 On Monday, 2 Kislev (November 28), OK Kosher Certification held its 13th annual International Mashgiach Conference in Chovevei Torah in Brooklyn, NY. Over 150 OK personnel and rabbis were in attendance, including rabbis from Japan, India, Greece, Israel, Poland, Germany, Belgium and others from around the world. 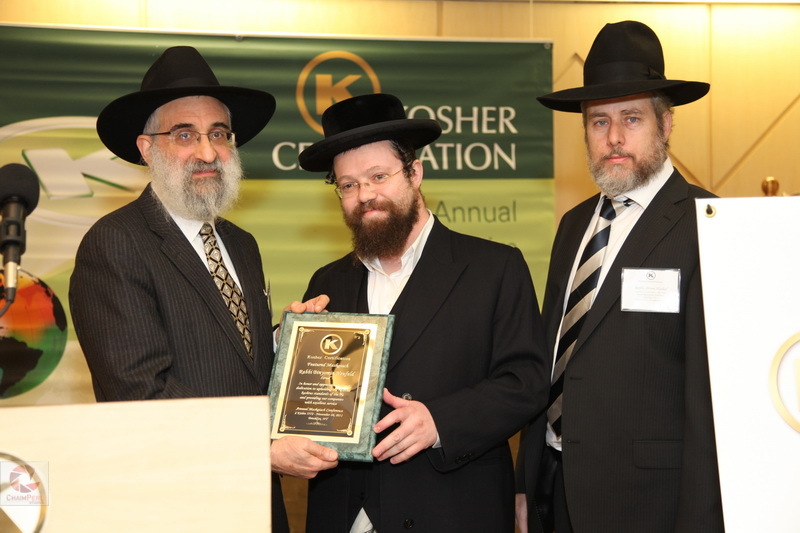 As in past years, the OK honored two rabbis. This year’s honorees were Rabbi Shloime Bistritsky, the newly elected Chief Rabbi of Hamburg, Germany, and Rabbi Binyomin Neufeld from Israel. 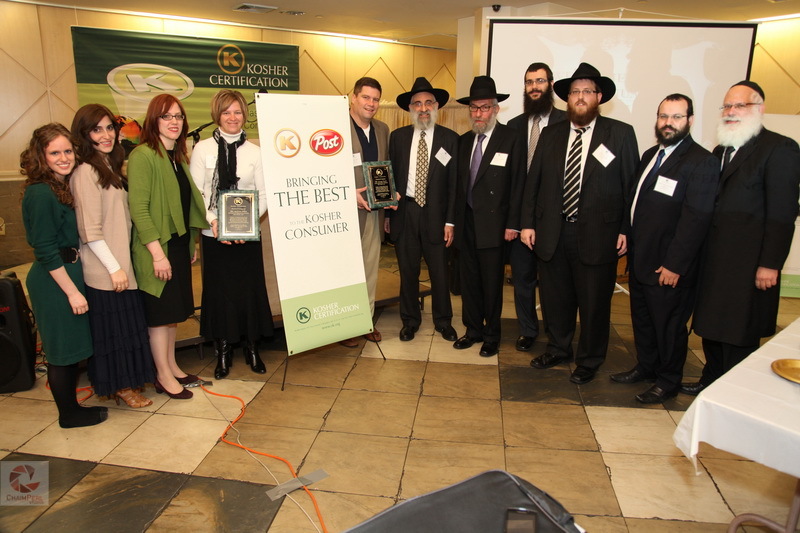 Both rabbis were chosen for their dedication to upholding the rigorous kosher standards set forth by the OK.
Every year the OK features a company that is making strides in increasing their kosher offerings and goes above and beyond to work with their mashgichim and rabbis. This year the OK honored two companies: Post Foods, LLC and Exter B.V. (a flavor company in Europe). For over 50 years, Post cereals have been kosher certified by the OK providing their customers with high quality kosher breakfast cereals. Rabbi Levy, Kashrus Administrator, opened the conference with words of Torah, inspiration, and the latest happenings at the OK. Attendees were also honored to have HaRav Yosef Braun, Rabbi of Crown Heights, share a few words of Torah. 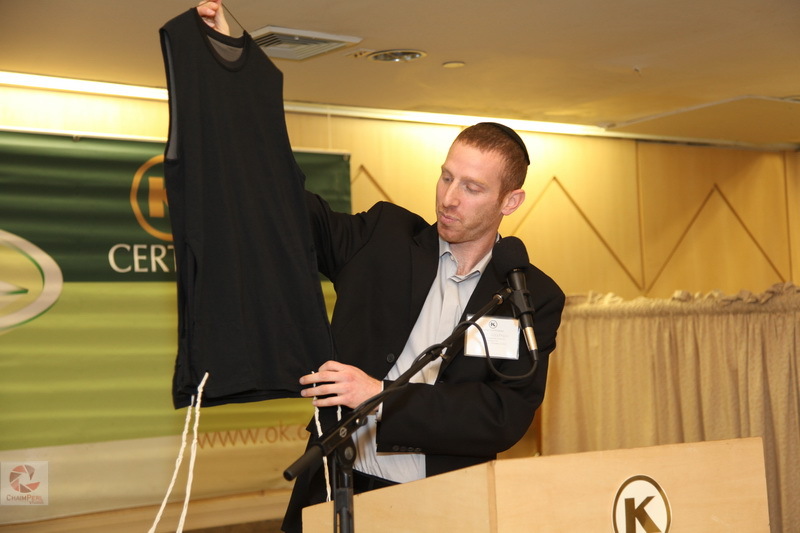 Rabbi Hillel Baron, from Columbia, Maryland, spoke about outreach opportunities within certified companies; Rabbi Yitzchok Ort, from Milwaukee, Wisconsin, shared insights into the changing kosher dairy industry; professional basketball player Tamir Goodman, also known as the “Jewish Jordan”, introduced his new innovation, SportStrings Tzitzis that are now certified OK; Rabbi Eli Lando gave a brief talk on customer service; Mr. Menachem Lubinsky, CEO of Lubicom Marketing, enlightened the rabbis on the growth of the kosher food industry; Rabbi Yitzchak Gornish a rabbinical coordinator at the OK shared his scientific knowledge with a presentation on the Chemistry of Kashrus; and Rabbi Yisroel Stern of Chassidus Mevueres spoke about the OK’s contribution to spreading the wellsprings of Chassidus through Heichal Menachem. Rabbi Chaim Fogelman MC’d the event with his much-loved combination of Chassidic insights and humor. The conference ended with a lavish buffet lunch catered by Bunch-O-Bagels and time for the rabbis to interact and share their experiences. Attendees received a brand new sefer by Chassidus Mevueres printed specially for this event. One of the greatest accomplishments of the kosher food industry was making mainstream products in the commercial cereal market kosher. When I think of breakfast cereal, the iconic Post® logo immediately comes to mind – that ubiquitous red oval logo that graces almost every American kitchen and conjures up childhood memories of countless bowls of Cocoa Pebbles and Raisin Bran. Every child that grew up in a kosher home eating Post® cereals shares in these memories. Founded in 1895 by C.W. Post, the first products were conjured up in an old barn in Battle Creek, Michigan. Post’s first creation, “Postum” was a cereal beverage and one of the first packaged breakfast products marketed in America. By 1897, Post® Grape Nuts, one of the first ready to eat cold cereals, was available for purchase by the public. C.W. Post bought a large parcel of land in Battle Creek and built a state-of-the art production facility alongside modest homes for his employees. He created both employment opportunities for a large segment of the local population, as well as housing for their families. The company continued to grow and from 1925 to 1929, C.W. Post’s company acquired over a dozen other companies and expanded production to more than 60 products. In 1929, the parent corporation name changed to General Foods Corporation. In 1942, Post® introduced its iconic Raisin Bran cereal, which is a staple product in millions of American households. In 1971, the perennial favorites Fruity and Cocoa Pebbles debuted in supermarkets across the country and in 1992 Post® recently celebrated the 100th anniversary of Shredded Wheat cereal. The OK has certified Post® Cereals for over 60 years. To date, over 3,500 kashrus inspections have been logged at Post® manufacturing facilities and seven rabbis oversee the kosher supervision program. Today, the OK certifies 64 varieties of Post cereals, produced in six different facilities. Some kosher certified varieties are pareve, while some are certified dairy (not Cholov Yisroel). Post® takes its commitment to kosher compliance very seriously. Dedicated personnel within the company work continuously with the OK to ensure that every step of the kosher protocol is followed precisely and that all products are accurately labeled. There was a time that kosher cereal contained non-kosher promotional items. This posed absolutely no kashrus issue, since the promotional item was individually wrapped and clearly marked as non-kosher. Unfortunately, however, there were still kosher consumers who were confused. 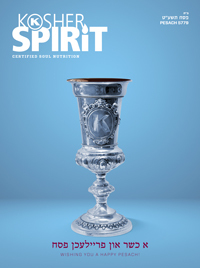 OK Kosher, known for its clear mission of kashrus without compromise, worked cooperatively with Post® management to protect the kosher integrity of Post® products and Post® went out of its way to discontinue the entire campaign despite the loss involved. Rabbi Eli Lando, Chief Customer Relations Officer at the OK, whose team works directly with Post®, is continually impressed by Post® Foods’ respect for the kosher consumer. “It is heartwarming to see that Post® appreciates the importance of OK Kosher’s high kosher standards and the needs of the kosher consumer. This achievement is a direct result of our commitment to full cooperation with our customers and we look forward to an ongoing relationship and growth for the benefit of all kosher consumers. The OK and Post® are proud to announce a new kosher certified variety of the famous, kid-favorite “Pebbles” cereals – Post® Chocolate Peanut Butter Pebbles Boulders. Ms. JaNeen Allen and Mr. George Dover accepted the Featured Company Award at our recent International Mashgiach Conference on behalf of Post® Foods, LLC. 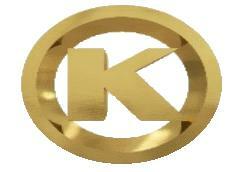 As we begin the new year of 2012, we at OK Kosher Certification would like to thank you for another exciting year. We are proud to serve your kosher programs and take great pleasure in the many new projects we are involved in with our existing and new customers around the globe. This year you can expect innovation on all fronts. Your Rabbinic Coordinator and Account Representative at OK headquarters are committed to providing you with the quality service you deserve. We urge you not to hesitate to contact them at any time. We also want to hear your compliments, comments or complaints about our service. Compliments − tell us when we get things right and when we should congratulate staff. Comments − help us with ideas for improving our services. Complaints − tell us when we are getting things wrong and we will make it right. We welcome your feedback by telephone (718-907-9595) or by e-mail (service@ok.org). In this addition of QuicKosher, you can also read about the highly successful conference we held in November. Our representatives from around the world gathered together in New York to learn about the latest in the industry and make sure we offer you the best possible service. We also honored two of our companies, Post Foods, LLC and Exter BV, and they are featured in this newsletter. We thank each and every one of our treasured clients from around the world for selecting OK Kosher to certify their kosher products and our exceptional staff for making it all possible. We are committed to keep being GLOBALLY YOURS.